Can a horse really do arithmetic? For a time a great many people thought so, enthralled by the exploits of Clever Hans, a horse that could seemingly answer any question about mathematics, language, and music with stomps of his hoof. Even as celebrated scientists endeavored to discover Hans’s secret, people were perfectly comfortable believing something no rational mind should have accepted. How is that possible? In The Horse That Won’t Go Away, Tom Heinzen, Scott Lilienfeld, and Susan Nolan explore the confounding story of Clever Hans and how we continue to be deceived by beliefs for which there is no supporting logic or evidence. From Clever Hans, to the unsupported claims that facilitated communication could allow persons with autism to communicate, to the exaggerated fear of many parents that their child may be kidnapped (the odds of such an event are astronomical), the authors show just how important it is to rely on the scientific method as we navigate our way through everyday life. 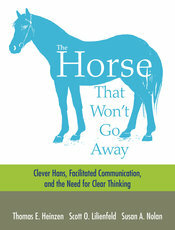 The Horse That Won’t Go Away is available as a separate volume or packaged with any Worth psychology textbook. For more information, contact your local Worth representative. "What would you do if you encountered evidence that contradicted one of your deeply held beliefs? You'd change your mind, of course, right? Wrong. What psychological science has revealed-lucidly and poignantly demonstrated in this marvelous book on how thinking goes wrong-is that we are all deeply flawed and biased reasoners, bending evidence to fit our beliefs and preconceptions. By retelling the famous story of Clever Hans, and connecting it to major myths of our time, The Horse That Won't Go Away is destined to become a classic in scientific literature and should be assigned to every course in critical thinking, along with every politician in Washington." "A terrific illustration (and, to a degree, an examination) of some of the most common causes of faulty judgment, anchored in two very compelling case studies." "This is a marvelous book. It's like a great performance of a Beethoven symphony. The authors hit every note perfectly."